Every so often we like to tell the stories of Arizonans who have done something amazing. These are everyday citizens that use their talents and time to make a difference here is Arizona. We hear enough about the bad, we want to highlight the good of this state. Kelly Smith is a game changer. Last year Kelly began a program called Code Club, a place where kids can learn to program free of charge. He wants kids of Arizona to be prepared for our changing economy. business by day and raising a family with the rest of his time. He is married, and together with his wife, has four kids ranging from age 9 years to 2. Their family moved back to Mesa a year ago when Kelly took a job at an internet start-up and was able to choose where to live. It was time to come home. Kelly is passionate about kids and education, tech and entrepreneurship and Arizona. Code club is a combination of those passions. Last year Kelly began volunteering at the Mesa library, teaching computer programming to kids ages 8-18. They meet weekly for two hours and the kids make games and animations. We know it is a great club because Marily's oldest son has been loving his time in the Code Club. It is very creative and fun while the kids learn the skills that will help them in this changing economy. This video gives a little insight into the club. This club is all free and 100% volunteer! Other volunteers like Andy Jennings of Mesa (who we also know is a great guy because he has freely helped us with some tech support here at I Heart AZ) and Sarah Prosory who is a Red Mountain Branch Librarian have been volunteering to get code club going strong. Six more volunteers are giving of their time now as well. 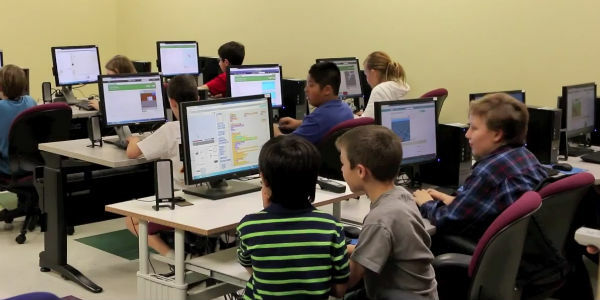 Code Club is now available for kids in downtown Mesa, east Mesa, and Camelback High School, with more opening in Scottsdale, Tempe, Gilbert, Chandler and downtown Phoenix. Kelly says, "The goal is to introduce thousands of AZ kids to programming and make it 'cool.' Maybe we'll find the next Mark Zuckerberg right here in AZ..."
Code Club needs your help and support to keep growing and expanding and reaching more children. They are having an event at the IDEA museum in downtown Mesa on Thursday, June 5th from 5:30 - 7:00 PM to get more and more people interested in coding. At this event, kid coders will be showcasing the games and animations they have been working on this past year. Come see what is possible with technology. This is a family friendly FREE event, but you do need to reserve your tickets. Click this link to reserve your free tickets. Also, make sure to go like Code Club on Facebook here. Or donate to their IndieGoGo campaign here. What are you going to do with your talents and passions to make Arizona a better place? Tell us here or on Facebook. Thanks Kelly for sharing yours.